Join Don Felder formerly of The Eagles and friends including Cheap Trick (special appearance 2/18), America, Todd Rundgren, Jefferson Starship, Rita Coolidge, Ambrosia, Pablo Cruise, Stephen Bishop, Peter Beckett’s Player, ABBA The Concert: A Tribute to ABBA, All You Need Is Love, Beatle Brunch Radio Host Joe Johnson, and many more artists to come in over 50 LIVE performances on The Feel Good Party At Sea! Relive those great rock concerts with the bands that rocked your world and your heart and over 25 celebrity interactive events while we sail to beautiful ports of Miami, FL, San Juan, Samana, Dominican Republic and Labadee. Sail with 2,000 other devoted ’70s music fans just like you for this ultimate ’70s reunion and buckle up for seven nights at sea as we celebrate the era that made you feel so good. The sun will be shinning, guitars jamming, drums drumming; and the nights will be heating up on the luxurious Celebrity Infinity. 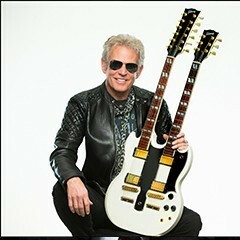 Enjoy this exclusive offer just for Don Felder formerly of The Eagles fans!